The question of the socialist left’s relationship to the Democratic Party has been a controversial issue for decades, in truth, for as long as we have had the modern two-party system. At various times the issue has been whether or not to break with the Democratic Party and construct a socialist party or a labor party instead. Some New Politics readers will recognize the title of this article as a paraphrase of Hal Draper’s “Two Souls of Socialism,” which appeared in New Politics in 1966. The first version, however, appeared in the socialist student magazine Anvil in 1960, just as a new generation of youthful activists was emerging, inspired to a large extent by the civil rights movement. I first met Kim Moody some 50 years ago. He was then organizing chapters of the California-based Peace and Freedom Party as an alternative to the Democratic war machine. If memory serves, he came to Park Slope, Brooklyn, then a predominantly Irish and Italian working-class neighborhood—not the gentrified picture from House Beautiful it has since morphed into—but also inhabited by a smattering of déclassé radicals. Moody wanted to interest a few of us in taking up the electoral mantle. Dornbush, Elliott-Negri, and Lewis are right that ideology is not enough and an analysis of “the actual, material terrain” is necessary. Simply repeating the well-known realities of the first-past-the-post U.S. electoral system that favors the two-party duality is not such an analysis. It’s old news. Not altogether wrong, but still yesterday’s political science. We working people live in darkening times. When the Trump presidency ends in four years—if it does—we may no longer have an organized labor movement. As one of my colleagues, Ed Ott of the Murphy Institute, the City University of New York’s labor school, said to me, “We are at the beginning of the end of the U.S. labor movement based on a partnership with capital.” We are at the twilight of an era. Labor unions and collective bargaining stand to be swept away, and with them the institutions that have sheltered us in the workplace and provided us with a modicum of job security, living wages, health insurance, and pension benefits. In an era when the federal government is increasingly dominated by fossil-fuel interests that limit regulation of oil rigs and pipelines, the environmental justice movement seems to have diminished significantly. A civil society emerges, mainly, due to citizens’ need to actively involve themselves in the public sphere in order to address processes that impact their daily lives and affect their interests. At the heart of civil society, various social actors, with sometimes remarkable differences, group themselves around common issues that affect or interest all of them. Therefore, civil society is plural, characterized by the spontaneous organization of citizens and based on logics of autonomy, solidarity, and representation of specific identities; it is aimed at addressing collective demands, exploring solutions to issues that affect a given community, and having an impact in the public sphere. This is the last of three articles commemorating the Russian Revolution of 1917 and analyzing its fate under Stalin. 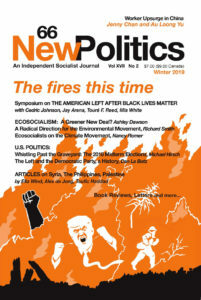 The first part, “Glorious Harbinger of a New Society: The Bolshevik Revolution,” was published in New Politics, number 62, winter 2017, and the second part, “The Tragic Fate of Workers’ Russia,” in New Politics, number 63, summer 2017. "The socialists consider it their principal, perhaps even their only, duty to promote the growth of this consciousness among the proletariat, which for short they call its class consciousness. The whole success of the socialist movement is measured for them in terms of the growth in class consciousness of the proletariat. Everything that helps this growth they see as useful to their cause; everything that slows it down as harmful." The largest single day of anti-war protest in human history took place on February 15, 2003, almost fifteen years ago. Millions of people rallied and demonstrated internationally, in more than 600 cities, with the goal of preventing the then-pending U.S. invasion of Iraq. These protests failed to stop the coming imperial misadventure, and more than a half million people were killed as a direct result, with millions more displaced, killed, or maimed in the geopolitical ructions that since followed. Explaining the specific failure of the anti-war movement to stop the invasion in 2003 requires an analysis that is beyond the scope of the following article. What Julius Jacobson’s piece does offer is insight into the left’s failures to build a sustainable anti-war and anti-imperialist movement since. The death of Joanne Landy last October is a profound loss to the socialist and internationalist movements. Joanne died less than a day shy of her 76th birthday, and for her entire adult life, she retained a commitment to the fight for a more democratic and more humane world, and to the politics of socialism from below. The closing of the era when comic art specialists, not people with PhDs, wrote the outstanding and recognized works on individual artists and genres may have arrived as recently as only a few years ago. Careful biographies of artistic giants, household names (in their own eras, at least) or famed only within the field, Al Capp or Will Elder, have continued to be written by people who could rightly be called “fans”—if the title did not seem insulting. Rather than university presses, Fantagraphics or the comics series at Abrams would be a typical outlet. With each year that passes and with each swelling enrollment in a college course, the scene shifts. The mode-of-production concept that Marx develops in Capital (although the idea is present earlier) is the essential methodological tool for understanding history, different societies, and the possibilities for social change. Social Inequality is not for the faint-hearted. It covers the major political-economic issues of our time, from the structural changes in the economics of capitalism, to class structure, the imperialist state, and the distortions of capitalist culture. The author, a veteran scholar-activist of the New Left generation who now lives in Costa Rica,1 ends with a plea for resistance to our oligarchic “hegemon” and suggests a series of tactics to help us on the road. IN 1942 British economist John Maynard Keynes got an advance preview of Lord William Beveridge’s report, Social Insurance and Allied Services. In it, Beveridge proposed a comprehensive system of social security that ran the gamut from full employment to national health care so as to eliminate “Want, Disease, Ignorance, Squalor, and Idleness” from the United Kingdom.